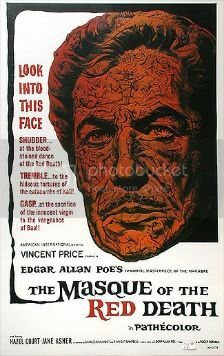 “Each man creates his own God for himself, his own Heaven, his own Hell.” As the Satan-worshipping “Prince Prospero,” Vincent Price revels in pure evil in this classic atmospheric horror film directed by Roger Corman—the seventh of his eight Edgar Allan Poe-based films released by American International Pictures (and the best of the entire bunch in my opinion). Set in medieval Europe, the film contrasts the nonstop partying vibe and total depravity in the castle (as Prospero welcomes any and all types of debauchery) with the destitute villagers as they attempt to cope with the deadly plague devastating the entire countryside. After ordering an entire village destroyed to prevent the spread of the plague, Prospero kidnaps a beautiful peasant girl named “Francesca” (Jane Asher), sparking the jealousy of his mistress “Juliana” (Hazel Court) who vows to win him back by any means necessary. However, Francesca proves a worthy adversary to Prospero, resisting all of his advances. All hell breaks loose (no pun intended!) after Prospero holds a masquerade ball that is crashed by a mysterious red-cloaked figure (guess who!). The "Man in Red" remarks to Prospero, “Why should you be afraid to die? Your soul has been dead for a long time.” The cast includes David Weston as “Gino,” Nigel Green as “Ludovico,” Patrick Magee (A Clockwork Orange) as “Alfredo,” Skip Martin (Vampire Circus) as the dwarf jester “Hop Toad,” Verina Greenlaw as “Esmeralda” and John Westbrook uncredited as the “Man in Red.” Charles Beaumont and R. Wright Campbell adapted the screenplay based on Poe’s classic 1842 short story of the same name, along with the addition of another Poe story first published in 1849 called “Hop-Frog.” It was filmed in England and Nicolas Roeg served as cinematographer. Useless Trivia: Asher was briefly engaged to Paul McCartney during the late 1960s.